The electroanalytic performances of glassy carbon paste electrode (GCPE), multi-walled carbon nanotube (MWCNT)-GCPE and double-walled carbon nanotube (DWCNT)-GCPE, which include HNO3 washed/unwashed materials, were compared by monitoring cyclic voltammograms of potassium ferricyanide and catechol. Electrodes were prepared by introducing proper amount of DWCNT and MWCNT into GCPE. First untreated materials (DWCNT, MWCNT, GC μ-particles) were used in the electrodes and then HNO3-treated materials were utilized for comparing difference in electrochemical performances. The effect of treatment procedure was also examined by applying Raman spectroscopy to treated and untreated materials. Moreover, TEM images were obtained for further investigation of MWCNT and DWCNT. Carbon nanotubes (CNT) have received considerable interest due to their attractive electronic, chemical and mechanical properties . Because of this diverse interest, many studies have been conducted in order to explain electrochemical properties of these materials. It has been reported that MWCNTs exhibit sidewall structure, which has similar electrochemical behavior as graphite basal plane of highly oriented pyrolytic graphite (HOPG), and the open-end one, which has electrochemical behavior similar to the edge-plane of HOPG . Moreover, the dependence of the electrochemical activity of MWCNTs onto CNTs fabrication procedure (arc discharge or chemical vapor deposition (CVD) methods) and the dispersing agent used to immobilize CNTs on the electrode surface has been shown . On the other hand, double-walled carbon nanotube (DWCNT) is the smallest example of MWCNT and consists of two concentric tubes. Besides, DWCNT may be interesting in many electrochemical applications since the outer wall could provide an interface with the rest of the system while inner wall can act as 1D (one-dimensional) nanowire [3, 4]. Other carbon material, GC μ-particles were utilized together with mineral oil to prepare composite electrode called glassy carbon paste electrode (GCPE). The combination of GC μ-particles with mineral oil results in the cooperation of favorable electron transfer kinetics of glassy carbon with the attractive advantageous composite paste electrode material. This electrode offers high electrochemical reactivity, wide potential window with a low background current while it is inexpensive, easy to prepare, modify and renew . Nitric acid treatment is widely utilized for purification and/or functionalization of CNTs. Application of washing procedure removes part of residual metallic impurities and amorphous carbon [6–8]. In addition, it has been reported that after nitric acid oxidation, the electrochemistry of ferricyanide, sodium hexachloroiridate(III) hydrate, catechol, dopamine, serotonin 5-HT and caffeic acid improved significantly . Recently, it has been shown that washing procedure did not remove residual metallic impurities, like iron and copper [10, 11]. In addition, “electrocatalytical” properties of CNTs toward some reagents, such as hydrazine, hydrogen peroxide and glucose are found to be related with the presence of these metallic impurities into CNT structure [3, 10–20]. In the present report, the effect of HNO3 washing on electroanalytical performance of GC μ-particles, MWCNT- and DWCNT-modified GCPE electrodes was investigated. For electroanalytic applications, specific reagents like ferricyanide and catechol were chosen. As far as we know, this work is the first example of application of nitric acid oxidation to GC μ-particles. In addition, it is the first example of modification of GCPE with nanotubes. The results that were obtained with plain GCPE were compared with voltammograms obtained with CNT-modified GCPE. The characterization of these materials was also made via Raman spectra and TEM. Obtained results were discussed and utilized for explaining electroanalytic behavior of concerned carbon μ-particles and nanotubes. Cyclic voltammetric measurements were carried out with the AUTOLAB PGSTAT 12 electrochemical measurement system from ECO CHEMIE Instruments B.V. (the Netherlands) driven by GPES software (http://www.ecochemie.nl). The experiments were conducted in a 10 mL voltammetric cell (Metrohm), at room temperature (25°C), using a three-electrode configuration. The GCPE was used as working electrode. A platinum electrode served as an auxiliary and an Ag/AgCl as a reference electrode. Electrodes were inserted into the cell through the Teflon cover. 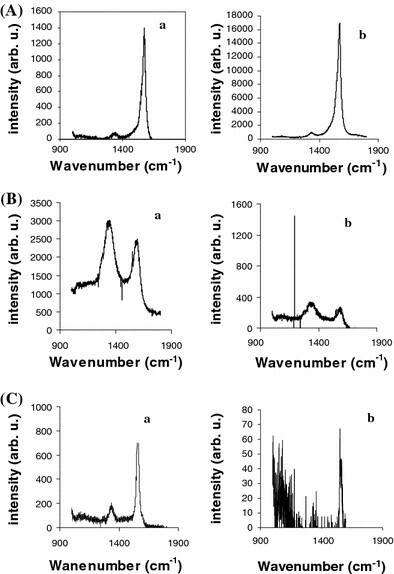 Raman spectra were obtained by using a T64000 Raman spectrometer (Horiba Jobin–Yvon Ltd, Japan) using excitation from an argon laser beam (λ = 514.5 nm), and the wavenumber range is from 1,000 to 1,800 cm−1. A JEM 2100F field-emission transmission electron microscope (JEOL, Japan) operating at 200 kV was employed to obtain TEM images in the scanning TEM mode (spot size 0.4 nm). 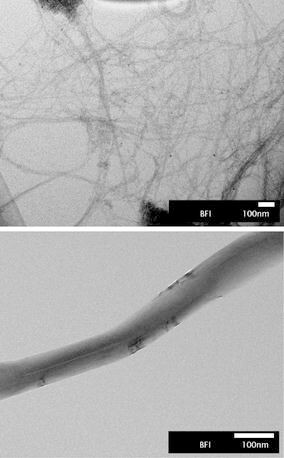 Multi-walled carbon nanotube (MWCNT 90% diameter: 110–170 nm, length: 5–9 μm), double-walled carbon nanotube (DWCNT catalog no. 637351, purity > 90%) and mineral oil were purchased from Aldrich (http://www.sigmaaldrich.com), while glassy carbon spherical powder, 20–50 μm, type 1 was obtained from Alfa Aesar (http://www.alfa.com). Potassium ferricyanide and catechol were obtained from Sigma (http://www.sigmaaldrich.com). Phosphate buffer (0.05 M, pH 7.0) was served as supporting electrolyte. All solutions were prepared by double distilled water. MWCNT- and DWCNT-modified GCPE were prepared by hand-mixing of 4% of nanotubes with 66% GC μ-particles and 30% mineral oil. Plain GCPE was prepared by mixing 80% GC μ-particles with 20% mineral oil. These are the optimum amount of composite electrode structure that was optimized in an earlier publication . A portion of the resulting paste was then packed firmly into the electrode cavity (3.0 mm diameter and 5 mm depth) of a PTFE sieve. Electrical contact was established via a copper wire. The paste surface was smoothed on a weighing paper and rinsed carefully with double distilled water. Same washing procedure  was applied to 1 mg of nanotubes and GC μ-particles except the particles were dispersed into 6 M 60 mL HNO3 for 5 h at 80°C and then at room temperature overnight. Then, they were rinsed with distilled water and dried at room temperature. Cyclic voltammetric measurements were conducted in the potential range of −500 mV to 1,250 (for ferricyanide) or −300 mV to +900 mV (for catechol) at 100 mV/s scan rate in the presence of same supporting electrolyte. Treated and untreated CNT particles and GC μ-particles were introduced into GCPE structure for preparing electrodes. Obtained cyclic voltammetric results for ferricyanide and catechol were compared with that of plain GCPE. First, the response of untreated nanotube-modified GCPE and plain GCPE toward 1 mM potassium ferricyanide was explored in 50 mM phosphate buffer medium (pH 7). By utilizing untreated 4% nanotube-included GCPE, voltammetric response was investigated over a scan range of 0.01–1 V s−1. The peak-to-peak separation for MWCNT-GCPE is 186 mV at 100 mV s−1, with a formal potential of 0.208 V (Fig. 1a, Table 1). 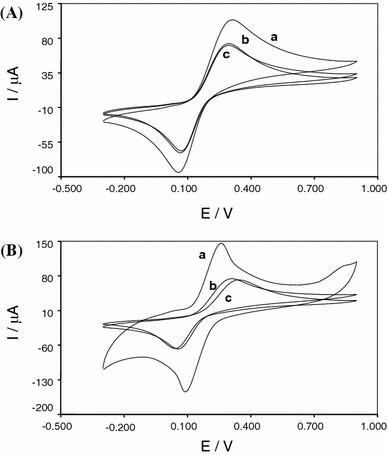 For DWCNT-GCPE at 100 mV s−1, ΔEp was calculated as 298 mV and formal potential as 0.225 V (Fig. 1b, Table 1). Narrow peak-to-peak separation and smaller formal potential were obtained with GCPE, 161 mV and 0.205 V, respectively (Fig. 1c, Table 1). As can be seen in Fig. 1, the peak-to-peak separation increases with increasing scan rates, suggesting quasireversible behavior. Next, 4% HNO3-treated nanotubes and GC μ-particles were introduced into composite electrode. Again, the cyclic voltammograms were recorded over a scan range of 0.01–1.0 V s−1 in 1 mM ferricyanide. As it can be seen in Fig. 2, quasireversibility is observed for all three electrodes. For MWCNT-GCPE, the peak-to-peak separation is 237 mV at 100 mV s−1, with a formal potential of 0.221 V (Fig. 2a, Table 1). The DWCNT-GCPE showed 234 mV, with a formal potential of 0.215 V at the same scan rate (Fig. 2b, Table 1). With treated GCPE, better results were obtained compared to nanotube-modified GCPE such as 166 mV as ΔEp and 0.203 V as formal potential (Fig. 2c, Table 1). Comparison of findings that were obtained from cyclic voltammograms of nanotube-modified GCPE with that of plain GCPE suggests that the carbon nanotube-modified GCPEs have slower electron transfer than plain GCPE. Utilization of HNO3 washed materials decreases ΔEp value in the case of DWCNT-GCPE and GCPE. In the previous work where DWCNT film was attached onto glassy carbon electrode (GCE), a 4 mV difference was observed in the favor of untreated DWCNT ΔEp value . In this system, inside the composite structure, we observed 64 mV narrower ΔEp value for ferricyanide when acid-treated DWCNT was used. It was reported that HNO3-treated single-walled carbon nanotube showed favorable electrochemical properties toward ferricyanide due to the presence of oxygenated carbon species, especially by carboxylic acid moieties . However, later it has been demonstrated that that similar treatment of DWCNT leads to slower heterogeneous electron transfer for ferricyanide . In addition, there are other works demonstrating that an increase in the presence of oxygen-containing groups on MWCNTs  and graphite  actually slows the rate of heterogeneous electron transfer. It is also known that the relationship between the amount and position of the defects and oxygen-containing groups generated by the nitric acid treatment varies significantly according to the carbon nanotube structure . Though under these circumstances it is difficult to evaluate the exact reasons for such contradictory results, we believe that two important differences in our work might relate to the results that we obtained. Compared to other DWCNT work where electrocatalytic activity of DWCNT toward reduction of ferricyanide was examined , our work differs at two points. Besides the structure of working electrodes (composite/film), there are also some differences between oxidation procedures. We have just kept the particles at 80°C in nitric acid for 5 h, while they kept them at 80°C in nitric acid overnight. It is obvious that more damage occurs when longer period of heating procedure is applied. In addition, the contribution of GC μ-particles has to be considered in our case. Obtaining almost 40 mV narrower ΔEp value for HNO3 washed/unwashed GCPE (Table 1) reveals that the electron transfer rate for ferricyanide is affected by introducing oxygen-containing groups to electrode structure. Further investigation was done with Raman spectroscopy, and spectra were given in the following parts. On the other hand, with untreated MWCNT, narrower ΔEp value was obtained compared to that of treated MWCNT. It has been reported that acid treatments can cause some damages to the nanotube structure especially at defects and caps. Besides the presence of five carbon rings, since these parts have enhanced reactivity due to the strong local curvature and imperfect geometry, they could be preferential sites for oxidation . As ‘electrocatalytic’ behavior of CNT-modified electrodes toward most analytes has been shown to be based on introduction of large number of edge-plane-like sites onto the electrode surface via CNT , destruction of these sites apparently affects the performance of MWCNT-modified electrodes. First, untreated nanotube-modified and plain GCPE were prepared and used for monitoring of oxidation of 1 mM catechol in pH 7.0 phosphate buffer at 100 mV/s. the pH of the buffer was optimized by Xu et al., who found that the peak-to-peak potential separation is the lowest at pH 7.0 . Under these working conditions, with MWCNT-GCPE, oxidation and reduction waves are observed at +0.303 V and +0.061 V, respectively, and peak-to-peak separation was found as 242 mV with formal potential of 0.182 V (Fig. 3Aa). For DWCNT-GCPE, oxidation and reduction potentials are at +0.286 V and +0.071 V with slightly lower ΔEp and formal potentials, which are 215 mV and 0.178 V (Fig. 3Ac). 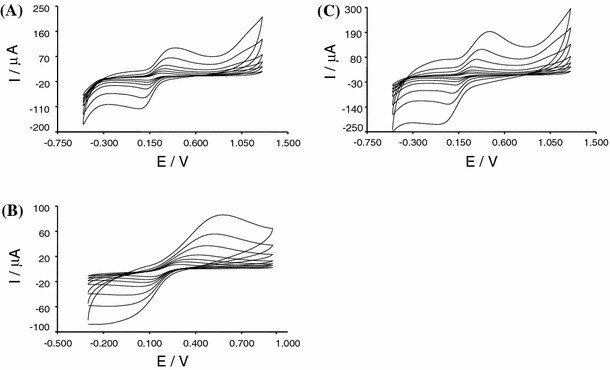 Under the same conditions, GCPE had oxidation potential of +0.288 V and reduction potential of +0.069 V which results with ΔEp of 219 mV and formal potential of 0.179 V (Fig. 3Ab). As depicted from Fig. 3Bc, oxidation and reduction waves are observed at +0.337 and +0.042 V, respectively, for treated 4% MWCNT-GCPE. The ∆Ep and formal potential were calculated as 0.295 V and 0.189 V. For DWCNT-GCPE, oxidation and reduction potentials are at +0.303 and 0.059 V again with slightly lower ∆Ep and formal potentials, which are 244 mV and 0.181 V (Fig. 3Bb). 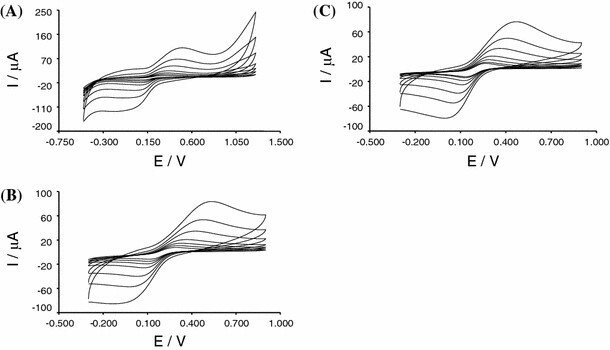 Under the same conditions, 4% treated GCPE gave +0.259 V of oxidation and +0.093 V reduction wave with ΔEp of 166 mV and formal potential of 0.176 V (Fig. 3Ba). Comparison of electrochemical performance of treated nanotube modified/plain GCP electrodes reveals a reduction in the peak-to-peak separation for catechol voltammograms at plain GCPE. The decrease in the peak-to-peak separation, when compared to nanotube-included GCPE, demonstrates faster rate of the electrochemical process, which also approves itself in an increase in the peak height compared to nanotube-modified GCPE as the process becomes electrochemically less irreversible (60.20 μA for MWCNT-GCPE; 58.52 μA for DWCNT-GCPE; 117.40 μA for GCPE). On the other hand, comparison of electrochemical behavior of acid-treated/untreated particles to catechol reflects the significant decrease at GCPE’s ΔEp value after washing procedure was applied. The exact reason for the promoted catechol oxidation is not fully understood. Since this material does not contain any metallic impurity (see TEM part), oxygen-rich groups on the GC μ-particles surface (introduced during the acid dispersion) could be partially responsible for this electrocatalytic behavior. Slightly better electrochemical response was obtained with DWCNT-CPE which could be attributed to same reasons as it is for ferricyanide above. Raman spectra were utilized for detailed characterization of MWCNT, DWCNT and GC μ-particles in order to understand their electrochemical behavior. Raman spectroscopy has been widely used recently for characterization of nanographitic systems including carbon nanotubes and glassy carbon . The Raman spectrum of a crystalline graphite exhibits one Raman peak at 1,580 cm−1, which is called the G-band, while structures with disorders that breaks the translational symmetry—like impurities, edges, finite size effects, etc.—results in another peak at 1,350 cm−1 and is usually called the D-band . where λ is the laser wavelength in nm units, I G is an intensity of Raman G-band, I D is an intensity of Raman D-band. The results were given in Table 2. When La values are examined, an increase is observed for GC μ-particles after treatment procedure while DWCNT showed a decrease (Table 2). The ratio of the integrated intensity of the D peak to the G peak, I(D)/I(G), is extensively used to measure degrees of disorder in a carbon or particle sizes of disordered carbons . An increase in the La value could probably prove the theory of interstitial carbon atoms, which are removed or reorganized especially on the graphite surface during the washing treatment . Another possible explanation might be the decrease in the concentration of smaller crystallites leading also to an increase in this value . It became clear that without proper and detailed characterization of CNT materials any interpretation of electrochemical data is useless [10, 17]. We thus used DWCNT and MWCNT samples which we carefully characterized previously by inductively coupled plasma—atomic emission spectroscopy (ICP-AES) and magnetic susceptibility [17, 31]. The ICP-AES showed that the amount of metallic in the washed DWCNTs is Co, 3.33% wt. ; Mo, 1.18% wt. ; and Fe, 0.045 wt%. The MWCNT are virtually impurity free, with Fe content of 0.0003% wt. Transmission electron microscopy (TEM) images of DWCNT and MWCNT samples are shown in Fig. 5. It is possible to see clearly the metallic impurities in DWCNT samples (dark contrast dots) while MWCNT sample is impurity free. No available information was obtained for % GC μ-particles since the material was too thick to be analyzed with TEM. However, from supplier data and from scanning electron microscopy/EDX (SEM/EDX) analysis of microparticles, no observable signal for metallic impurities was recorded. The aim of present study is to compare the effect of HNO3 washing on the performances, especially on electrochemical performances of MWCNT-GCPE, DWCNT-GCPE and plain GCPE. For ferricyanide, only DWCNT-GCPE shows slight improvement in electron transfer rate. Since reduction of ferricyanide has not been catalyzed by metallic impurities , this reduction in ΔEp value might be due to presence of GC μ-particles, in other words, there can be contribution of composite structure of DWCNT-GCPE to the electron transfer rate of ferricyanide. On the other hand, regarding three types of electrodes, best electron transfer rate was obtained with untreated GCPE for ferricyanide. For catechol, ΔEp values decrease after treatment of GC μ-particles with HNO3. This increase in the electron transfer rate might be attributed to electrocatalytic behavior of oxygenated groups that were introduced to the structure by means of the washing procedure. This work was supported in part by the World Premier International Research Center (WPI) Initiative on Materials Nanoarchitectonics, MEXT, Japan (M.P.). U.A. and M.P. acknowledge support by NIMS Open Research Institute fund (NIMS ORI).